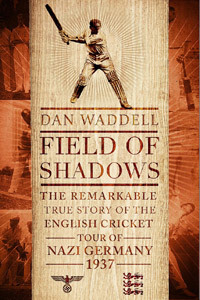 We know that cricket literature encompasses a vast number of subjects but Dan Waddell’s excellent Field of Shadows now brings us an English cricket tour of Germany. Nazi Germany. Like many countries, cricket is played in Germany – my guru and mentor, the late Bill Frindall, was Patron of German Cricket and his guests, also from Berlin, I am sure, came to a Lord’s Test in around 2007 or 2008 – but it is safe to say that it wasn’t a game which flourished under the Third Reich. Essentially, the Gentlemen of Worcestershire were invited to make a tour to Berlin in 1937, four years into the thankfully short reign of the Nazis but two years before war was finally declared upon them after their aggression against Czechoslovakia and Poland. Even in 1937 and at the time of the hastily-arranged tour, no less a figure than Sir Pelham Warner expressed the view that the Gentlemen of Worcestershire must not lose. They didn’t, the German batting being, at best, fragile but Hitler’s antics were already disapproved of and it would have been unforgiveable for this English touring team to lose this most English of games and give the Germans something further to crow about. The Gentlemen of Worcestershire enjoyed tours to obscure places and included some county cricketers and had rules relaxed for them during their stay. Major Maurice Jewell had been one of the stalwarts between the World Wars who had been the saviour of Worcestershire C.C.C and indeed became one of two English cricketers to make a century in Germany. Regularly, the German sides failed to make a hundred between them. Well-healed, the tourists paid their own way to Berlin and stayed in some comfort in the Adlon Hotel near the Brandenburg Gate. The one obstacle to the tourists was a matting wicket which they overcame to win all of their matches. A further hindrance was the presence of a photographer close in: he appears to have been walloped once for his efforts but his photos suggest a certain stiffness and statuesque appearance of the German fielders. I doubt that television sets were in evidence in Germany at the time but they may have heard of Douglas Jardine and Bodyline as the vast number of their fielders were positioned on the leg side. Dan Waddell’s story is a gripping one. Two Germans, Felix Menzel and Arthur Schmidt, both appear to have been decent cricketers. Menzel would do anything for a game of cricket: the fact that his country had had war declared upon it did not deter him, and Waddell, a self-proclaimed Boycott hero – well done, it means that I can admit to the same! – is the ideal man to write about Menzel. Schmidt, on the other hand, may have had Jewish roots and may have had his life ended like many millions whom the Third Reich took such distasteful exception to. Not selected for the games against the English tourists, Schmidt could only umpire. Was there a spy amongst the group also? One chap, with little in common to the rest of the party and who flew at great cost to Berlin after the remainder of the group had arrived, might just have answered to the question but there is no direct evidence of it. The book continues with German cricketing fortunes after the tour and after the war and it is nice to read about the exploits of the Gentlemen of Worcestershire players off the field after the war. A few lived to a decent age, two were sadly lost during the war and Felix Menzel was still looking for a game long afterwards. It is a shame that there are so few records of German cricket before and after the Second World War. Hitler may have viewed the game – and, after all, how much did he know about it? – as “effeminate” and “un-Germanic” so, bearing in mind what seems to have been destroyed towards the end of the war, maybe it is not a total surprise. The final game of the tour was played at the Olympiastadium, home just beforehand to the 1936 Olympics made infamous by Hitler’s refusal to shake the hand of Jesse Owens. Maybe that is the image of the games and Dan Waddell touches upon the subject. There is a road close to the stadium called Jesse-Owens-Strasse but, needless to say, it wasn’t named thus during the reign of The Third Reich. Dan Waddell is to be congratulated on his research and writing of Field of Shadows. It cannot have been an easy subject to find out about but he writes with a refreshing, understated sense of humour whilst also mentioning interesting points about the Second World War. I would unhesitatingly recommend this book.